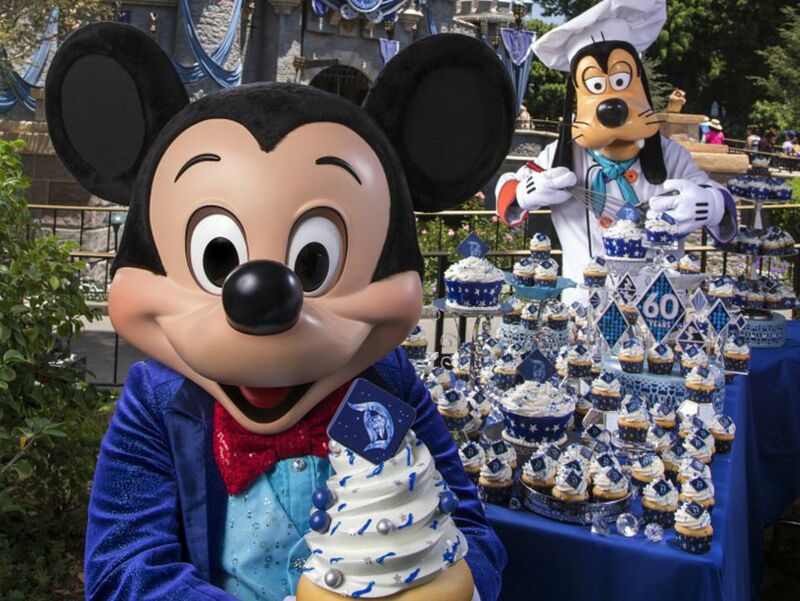 In 2015, Disneyland Resort hosted a yearlong Diamond Celebration that saluted 60 years of magic. Three electrifying new shows will make their premieres, adding to the lineup of attractions and family-friendly fun every day. The celebration began on May 22, 2015 and ended on September 5, 2016. As part of the celebration, the iconic Sleeping Beauty Castle in Disneyland and Carthay Circle Theatre in Disney California Adventure each received its own diamond medallion featuring the letter "D." The Disneyland Resort and surrounding streets were decked out in Diamond Celebration décor and festive banners in shades of Disneyland blue. In addition, special Diamond Celebration merchandise and food items were available to complement the celebration. Since opening July 17, 1955, the Disneyland Resort has grown from a single park to a world-class family destination with two wildly popular theme parks, three hotels and the shopping, dining and entertainment district known as Downtown Disney. “Paint the Night” parade: This nighttime celebration on Main Street, U.S.A. of Disneyland Park is a dazzling display of technology and wild imagination featuring more than 1.5 million brilliant LED lights. It is the first all-LED parade at the Disneyland Resort. In this luminescent parade, Mickey Mouse uses his imagination to “Paint the Night” in eight different Disney dreams that include special appearances by Mickey’s pals and beloved characters from tales such as “Monsters, Inc.,” “Cars,” “The Little Mermaid,” “Beauty and the Beast,” “Toy Story” and “Frozen.” The parade features special effects, music, energetic performances, and spectacular floats, with Mickey leading the grand finale. “Disneyland Forever” firework spectacular: The Disneyland tradition of fantastic fireworks rose to a new level with projections across Disneyland park, fantastic music and other special effects. Thanks to the largest installation of projection mapping technology in a Disney park and innovative special effects, guests are transported into beloved Disney and Disney/Pixar films, including a dance with King Louie from the “The Jungle Book” and a flight over London with characters from “Peter Pan.” Disneyland Forever” will be visible from Main Street, U.S.A., and several other Disneyland locations. “World of Color – Celebrate! The Wonderful World of Walt Disney”: The waters in Paradise Bay lagoon in Disney California Adventure is the setting for a whole new presentation of “World of Color” during the Diamond Celebration. “World of Color – Celebrate!” pays homage to Walt Disney and his dream of Disneyland with more than 1,200 fountains, lasers, special effects, a stirring musical score with Tony and Emmy Award-winning Neil Patrick Harris and Mickey Mouse as host. In addition, for the Diamond Celebration several of Disneyland's attractions received new additions. For example, the Matterhorn received new Yeti figures and the Haunted Mansion brought back the Hatbox Ghost. When Walt Disney opened Disneyland on July 17, 1955, it had 18 attractions, no Disney hotels and very little except orange groves surrounding it. Today, the original theme park has expanded to become a world-class family resort destination with two Disney parks, nearly 100 attractions, three hotels and the shopping, dining and entertainment district known as Downtown Disney.